This article contains fast, interesting, fun facts about Qetesh for research, schools, students and kids providing an insight into the lives and religious beliefs of the ancient Egyptians. This goddess originated in Canaan and was the goddess of sacred ecstasy and sexual pleasure. 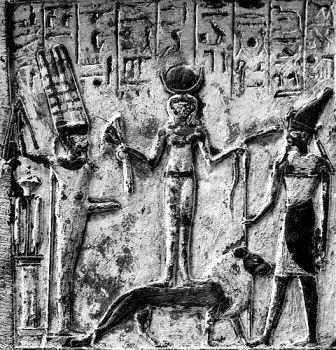 The image of the goddess depicts her standing on a lion with her consort Resheph the god of plague and war who was originally worshipped in Syria and Min the Egyptian god of rebirth and renewal. 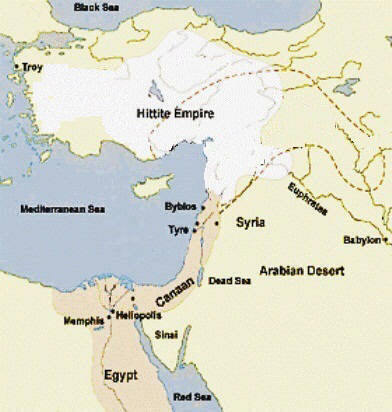 During the rise of the Egyptian Empire (see map below) during the period of the New Kingdom the ancient Egyptians were influenced by the cultures of many other countries. The ancient Egyptians adopted a policy of assimilating some of the important foreign deities, such as Astarte (Ishtar), Ba'al and Mekal, as they were cautious not to offend gods worshipped by other civilizations. This practice is called 'syncretism' which means the fusion of gods, religious practices and beliefs and their integration into an existing system. As she was connected with fertility and sexuality many images of the goddess portrayed her as naked or semi-naked. In the above picture the goddess is wearing the headdress of Hathor the Egyptian sky goddess of love, joy and fertility and the patroness of song, dance and ecstatic states. The sexuality of both of these goddesses resulted in obvious comparisons. She stands on a male lion, which is unusual as most depictions of this animal are the female lioness representing war. The Egyptians also called her Qedeshet, Quadesh, or Qudshu. 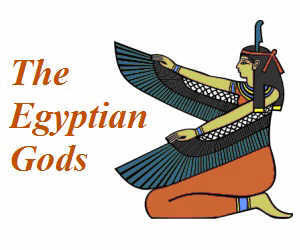 Her epithets include the "Lady of the Stars of Heaven" and the "Beloved of Ptah". In the area covering Canaan and Syria (called the Levant) the cult of this goddess involved her acolytes replicated the sacred marriage between the goddess and Resheph. Facts and information about Qetesh for kids with some amazing, cool and quick information about ancient Egypt and Egyptians. These fast interesting facts about Qetesh are ideal for children, homework, schools, teachers and kids of all ages.